Cantata, a (yet another) client for the music player daemon (MPD), just reached v1.4 with new features and many improvements. Streams – allows saving of internet radio URLs, searching for stations via TuneIn or ShoutCast, station listings from; Digitally Imported (+Sky, JazzRadio, RockRadio), TuneIn, IceCast, ShoutCast, SomaFM, etc. Use external helper app to read/write tags. Isolates Cantata from TagLib crashes. Option to auto-switch to context view. Comment tag support for tag-editor and dynamic playlists. Attempt to respect menubar usage of current DE. Reduce memory used by covers. Artists and albums with new tracks shown in bold. ‘Touch Friendly’ option – increases button widths, and makes views flickable. 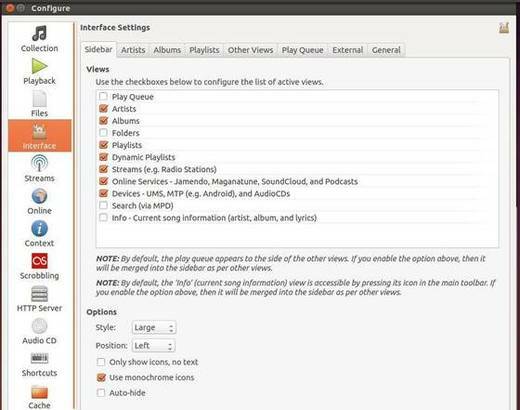 Streams now stored in ‘[Radio Streams]’ MPD playlist. Compatible with MPDroid development version. Use MusicBrainz AlbumId (if set) to differentiate albums. This helps if you have multiple releases of the same album. Search for streams via dirble. Reduce supplied stream providers to IceCast, ShoutCast, Drible, and TuneIn. Provide dialog to download others from Google drive. Show song lyrics, information, and tags, in context view. Besides building from source, Ubuntu 14.10, Ubuntu 14.04 and Linux Mint 17 users can install this release from PPA. The above will add my personal PPA and install cantata packages from it. Don’t forget to install MPD daemon (available in Software Center) if you don’t have it. If you don’t like Ubuntu PPAs, grab the .deb package from HERE. This simple tutorial is going to show you how to install the latest release of MPD client cantata in Ubuntu 14.04 Trusty Tahr via PPA. 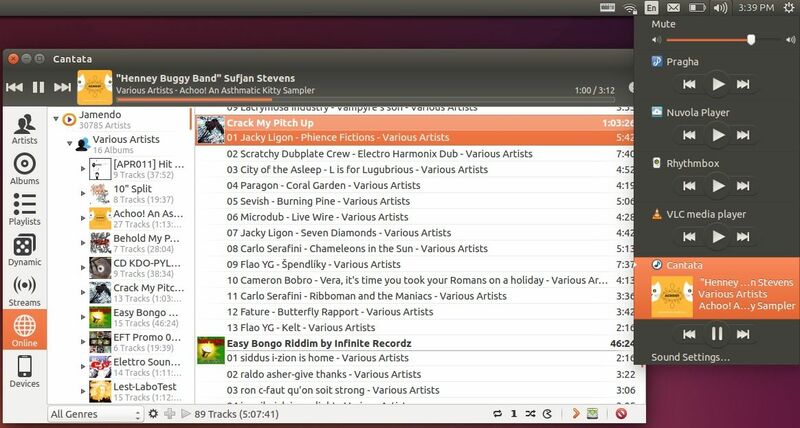 Cantata is yet another client for the music player daemon (MPD), which was originally started as a fork of QtMPC, the code is now very different. It can be compiled with KDE support, or as a pure Qt4 application. The interface is very configurable – most views can be shown as either a list or tree structure. Fix adding songs to playqueue with priority when playqueue is not empty. When loading covers, if load fails, check to see if this is because of an incorrect extension. e.g. load a .jpg file with PNG type, and vice versa. Fix showing of time-slider when Cantata is started minimized to system tray and MPD is playing. Don’t treat albums with artists such as ‘AlbumArtist ft Other’ as multiple artist albums. Fix updating of playqueue sidebar tooltip and icon. Add playqueue action to main window, so that shortcut works. When using track organizer, also try to move artist images, backdrop images, and playlist files. After altering filename scheme from track organizer, save settings. Don’t set year or disc in tag editor for ‘All Tracks’ unless they are non zero. In tag-editor, when obtaining values to use for ‘All Tracks’ entry, don’t ignore empty fields. When determining album year, ignore playlist files! If MPD database is refreshed whilst listview is not at top level, then reset view to top level. When TrackOrganizer is called after TagEditor, only perform MPD update once. When editing filename scheme, after inserting a variable set cursor position to after newly inserted text and give focus back to line edit. Cantata, yet another client for the music player daemon (MPD), has recently updated to version 1.3.3 with improvements and bug fixes. As you may know, cantata was originally started as a fork of QtMPC, the code is now very different. It can be compiled with KDE support, or as a pure Qt4 application. The interface is very configurable – most views can be shown as either a list or tree structure. Add song to playqueue from albums page when double-clicked. 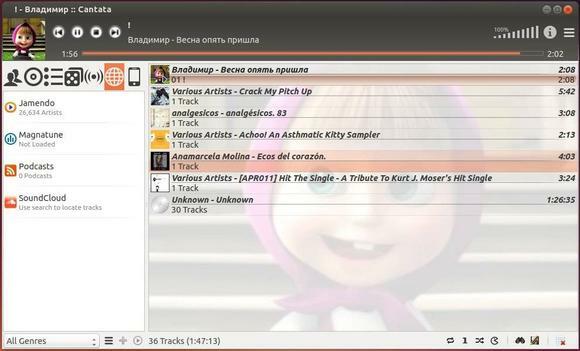 Fix display of online-service track album-artist in copy dialog. Ensure library is loaded the very first time Cantata is run (ie. after connected to MPD via initial settings wizard). When song is updated in context view, abort any current network jobs. Fix expand all / collapse all actions. Expand all will only expand 1 level for main browsers. When reading lines from user mpd.conf file, read as utf-8. Reset devices and online-services models when artist-view cover size changes. If downloading online-service track listing fails, then stop loader and show error. Use new location of Jamendo DB listing. I’ve uploaded the latest build of this MPD client to my PPA. It’s available for Ubuntu 14.04 Trusy, Ubuntu 13.10 Saucy and their derivatives. Cantata, yet another client for the music player daemon (MPD) has reached release 1.3.2 with improvements and various bug fixes. As you may know, Cantata is one of the most feature packed MPD clients, excelling at common use cases (playlists, streams, library management, lyrics) and including many features found in advanced media players (dynamic playlists, synchronization with external media players, transcoding, replaygain scanning, support for multiple MPD servers). In cover/artist dialog, when attempting to save an image into Cantata’s cache folder – ensure the ‘covers’ sub-folder is created. Use case-insensitive sort of folder view items when adding to playqueue. When determining the ‘basic’ artist of a track, if albumartist is set and artist is not, then use albumartist. For the web-links in the context view, replace ampersand and question mark characters in artist names with the relevant URL encoding. Use CMake to locate X11 libraries and headers. Set minimum size for initial settings wizard. If buddy of a checkbox or radio is clicked, then toggle check or radio. Disable context-view cancel actions until a job is created. When searching models, also search composer field. Fix enabling of “Initially collapse albums” in playlists settings tab. Fix grouped playlist view initial state when set to initially collapse albums. Fix calculating size of song files when copying off a device that has been previously scanned, and its contents cached. When copying from a CD, check that we have enough space for track that was encoded with a 1:18 ratio. Just a sanity check really. Fix song notification mem-leak (Linux only). When transitioning between backdrops in cover view, draw old at correct position. Dont load library twice at start-up when cache has been deleted current tab is artists or albums. You can also build it from the source tarball which is available in kde-apps.org.